Last summer we had the pleasure of designing and building a delightfully whimsical tiny house for a musician based out of Eliot, Maine, KB Whirly. Mr. Whirly takes his tiny house on tour to campgrounds around the country where hosts impromptu shows for kids and families. He can also be found playing at festivals around the northeast. This musical tiny house doubles as a vacation home for his family and even makes some Airbnb income on the side. How did we design the Whirly House? The Whirly House started as an idea pitched across a campfire. When the Whirly House was ready to become a reality, Mr. Whirly sent us loads of creative thoughts and we did our best to transform them into something tangible. That's how the drop-down stage, pull-out bed, and wet bath were born. Tiny House Crafters made sure the portability concerns and utility features would jive. Together, we designed a system where pulling up to a parking spot and putting on a show was as easy as 1-2-3. And in July 2017, the Whirly House was born! What are the special features of the Whirly House? The Whirly House features a portable, drop-down stage, a pull-out queen-sized mattress that doubles as a sofa when not in use, a complete wet bath with composting toilet, and an optional off-grid water system. The raised kitchen (to make room for the pull-out mattress and water system below) is fully functional with a two burner cooktop and a propane refrigerator. There is even a butcher block bar and desk with an extendable leaf for extra space. In order to make the Whirly House more portable, we reduced the overall height in order for it to be able to travel more places off-limit to full-sized tiny houses. The flat roof opens up the opportunity for roof deck concerts! KB opted for stained plywood wall paneling, a cork ceiling, and a corrugated metal wet bath on the interior. On the exterior, we got really funky with three different kinds of siding: blue corrugated metal, cedar tongue and groove boarding boards, and cedar shakes! Oh, and you'll notice that after purchase, Mr. Whirly added a custom guitar - that can actually be played! 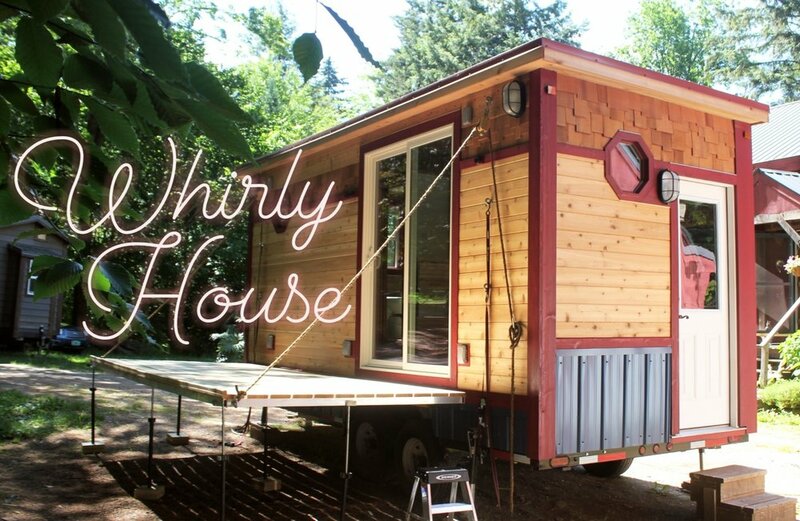 You can see more videos of the Whirly House on our videos page and on Instagram @tinyhousecrafters.com. Where can I see the Whirly House? Check out KB Whirly's music and website - it's great for kids and families - to see if the Whirly House is coming to an area near you! Be happy like this guy! See another tiny house with a drop down porch!